Partitioning in vista:How to partition hard drive or disk in windows vista? Partitioning a hard disk/drive or creating a hard disk partition in windows vista using the disk management utility is quite simple.However you must have administrator privileges to partition the hard drive. Also you can do the partition in windows vista, using the disk management utility, only if the drive or volume to be partitioned is in NTFS format or it is un-formatted RAW. This approach to partition a hard disk/drive in windows vista is also recommended only on a hard disk or drive, with no bad sectors.It is also recommended to partition only a hard disk or drive that has enough space available to shrink as some of the vista operating system files, that are used by the windows vista operating system (OS), like page files or shadow copy storage area cannot be relocated. How to partition a drive in windows vista? Choose the Drive to partition. Right Click and choose Shrink Volume. Windows vista will first calculate the maximum space that can be freed. You can then manually edit the amount of space to shrink by changing the value in the text box labeled “Enter the amount of space to shrink in MB“. However the amount of space to shrink cannot be greater than the size of available shrink space and available shrink space can be restricted if snapshots or page files enabled on the volume or drive. Format the partition as NTFS.You can either choose the “Allocation unit size” as Defaultor change it. That is all folks. 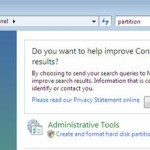 You would have successfully partitioned the hard drive in windows vista, upon completing the above steps.Vista would have formatted your newly-created partition inside the Disk Management console.you can see your newly-created partition in “My Computer” available to read and write to. 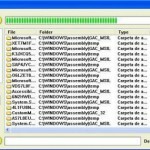 How to resize or create disk partition in windows 7 or vista? I could shrink the volume to only half of its size. Say initially a 60GB dark disk can be shrunk only to 30 and 30. I think this applies mainly to primary partition. Great tutorial. Can you repartition drives in Vista or do it have to be unallocated space? That’s one thing I hated in Vista, you could never change the size of a parttion. Nirmal, You can shrink the volume to whatever size that is available.Not necessarily half.vista would automatically calculate the available shrink space after taking into account the space currently used by your data, on such drive.This available space may further be restricted by snaphots and pagefiles enabled on that drive. Aseem, Thanks and yes you can and that is what this article is about…you have to shrink an existing drive to create unallocated space and then use this space to create the new partition. You can shrink, extend, create, and format partitions.What do you mean when you say that you could never change the size of a partition in vista? Infact in vista, you can resize the partition (extend or shrink the volume size), without loosing data and without the need for a third party tool like Partition Magic. But backing up your data, in the drive that you want to partition, is always a good practice, before you actually carry out the partition. When I tried to shrink my C drive, the primary partition and Vista installation drive it didnt allow me to reduce the size of C below its half value. Initially it was 80GB and when I shrunk it C could be reduced only to 40GB and not less than that. I think you got my point. I’m not sure if it happened because of any other settings. I would like to partition my hard disk which is 320 GB running with vista having a free space of 140 gb.When Itried doing that by shrinking as suggested above the max allowable shrink showing is 70 MB(not GB)Can any one plz help me in doing that.